The most substantial properties associated with the hamlet are Kershope House and its lodge. 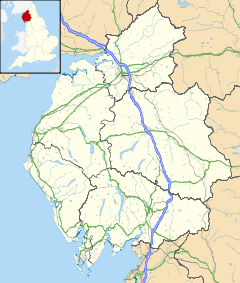 Kershopefoot is a small hamlet in Cumbria, England, formerly in Cumberland. It is located very close to the Scotland-England border and is near the Kershope Burn and the Liddel Water. Kershopefoot is most well known for its magnificent and breathtaking lodge house (Kershope Lodge) situated almost a mile from the hamlet. Between 1862 and 1969 a passenger station on the Waverley Line variously known as Kershope or Kershope Foot was located here. This page was last edited on 11 November 2018, at 09:26 (UTC).